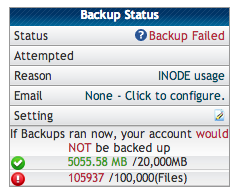 I was look­ing through my Cpanel recently and noticed that my backup sta­tus shows that my files “would not” be backed up. Whats that all about? 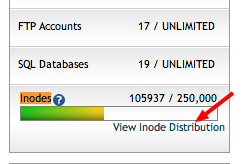 Well it appears my inode usage has gone above the 100,000 file usage range. Whats that mean? In a nut shell, any file asso­ci­ated with our cpanel counts as an inode. I have sev­eral domains, email addresses, and CMS installs run­ning so its easy to see where its all com­ing from. Basi­cally every email counts as an inode. My main email address has an unlim­ited mail box size and I tend to check my email via web­mail. This means all of these files stay on the server. Hence a rather large inode count. To reduce this one can go into their web­mail pro­gram start delet­ing old emails. A quicker way might be to setup a mail pro­gram on your local machine. In the setup process make sure to choose the option to down­load and then delete mes­sages from the server. My Mail pro­gram is Mac Mail. The option to delete mes­sages is under Pref­er­ences > Accounts . Advanced tab. Some things I con­sider are: Do I have back­ups locally? Yes I do (via Time Machine). Do I need these mes­sages to be avail­able from another machine > work for exam­ple (via web­mail), or your mobile device. This could bea big issue if you travel and need the ticket info. In my case I had sev­eral years worth of email on the server. I am going to pull them all onto my local machine, have mail pro­gram delete the rest. I will then run a backup. I can then change the set­ting on my local machine to “not” delete mes­sages on the server. In my case this will remove half of my server inodes. No, my auto­matic back­ups should work again. What else can you do to reduce inode usage? Check to see how many CMS, blog, or other data­base related installs you have on your server. I hap­pen to host a few sites for fam­ily and my church. How­ever I did have sev­eral test installs that I was able to remove to help lower the inode count. Another thing you could do might be to pack­age col­lec­tions of files into com­pressed zip files.